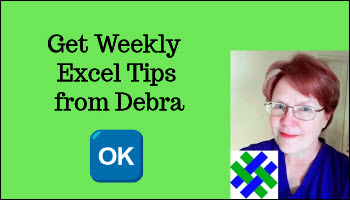 If you find a sample Excel macro on the Internet, you might want to add that code to one of your workbooks. This video shows how to add that code to a regular module, and there are written instructions below the video. Some code is Event code, and will run automatically when something specific occurs in the workbook. 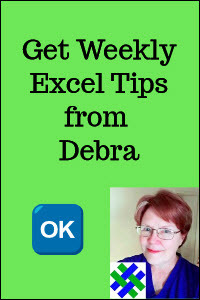 For example, if you type in a cell, and press the Enter key, the worksheet has been changed. This could trigger the Worksheet_Change event. 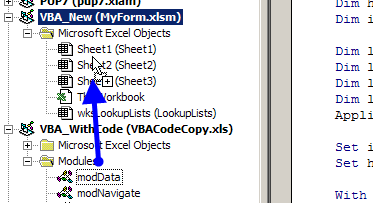 Right click on the sheet tab and choose View Code, to open the Visual Basic Editor. You may find code in a sample workbook online, and decide to add it to one of your workbooks. Click on the module that you want to copy, and drag it over the project where you'd like the copy placed. Release the mouse button, and a copy of the module will appear in the workbook.